The developers behind the next giant project about to start construction on Broadway are meeting with the community this Tuesday morning. As you’ve probably seen, the lots where the 230 Broadway project will be built are in process of being demolished and wiped clean. Next comes construction of the 6 stories, 23,000 square feet of office and retail space, 235 residential units and, yes, 362 units of parking space on three underground levels. Details on the meeting should you like to attend, are below. CHS will be there (barring breaking news) and will provide coverage. To the CHS commenter who keeps asking why this isn’t called the 230 Broadway *East* project, here’s your chance. 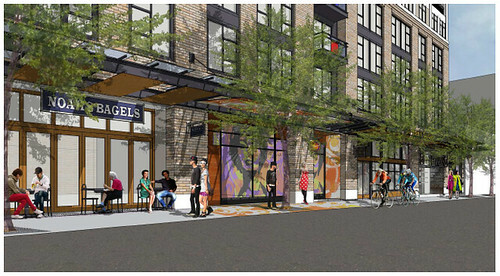 Construction of the 234 unit mixed use B230 project is quickly approaching. Our goal throughout the duration of this project is to keep the adjacent residents and businesses informed of our construction schedule and any impacts that will affect the daily lives of those working or living near our construction site. We would like to invite you to a pre construction meeting located in our field office at 224 10th Avenue East at 10am on 4/19/11. Provide a base line construction schedule. Discuss potential impacts and preferred method of relaying these impacts to neighbors. Create an email distribution list for notices and updated schedule information. Answer any questions you may have regarding the project. Provide contact information for on site management. If you are unable to attend the meeting but would like to be added to our neighborhood email distribution list please provide your email address to James Wilkins at jwilkins@srmdevelopment.com. We will begin demolition of the existing structures on April 4, 2011. Construction of the new 234 unit mixed use building will begin on or around May 1, 2011 and is scheduled to take approximately 20 months to complete construction. We look forward to working closely with you all to minimize disruption to your daily lives throughout the construction process and also to being great neighbors in the future as we complete construction and operate the building. Hopefully say, approximately 130 of those spots are used for public parking. Then maybe people won’t freak out about on street parking disappearing. Since we know they won’t take the buses/streetcar that will be at the front door just in time for rentals/retail space to hit the market. So, will there be charging stations in the parking area? For residents, if not for the public? There will be 72 spaces allocated to commercial uses. Although it’s important to keep in mind that doesn’t mean public. It just means privately owned by a business rather than an individual. Whereas it currently isn’t required by code (I’ve done my part and wrote city council) I have head that most developers want charging stations in their projects, as it gives them a marketing edge over competitive developments. I remember reading somewhere that the arch from the old bank building (no, not BofA) will be preserved and incorporated into the new development. Is that true? Also, I noticed yesterday that the scaffolding they had erected in front of that old arch had been removed, perhaps to make sure that it was harder for people to get at the old facade? Someone had sprayed graffiti all over it. How sad. Actually the streetcar will stop at Denny (Light Rail). No funding as of now for it to go any further. Nope. They are going with a design that includes trashing the arch. FYI–your neighbors and business owners and Cap Hill Chamber of Commerce attended the Design Reviews, but no one cared that most people wanted the arch preserved. Sorry–that’s Seattle. All red carpet for developers and a shrug for the rest of us.